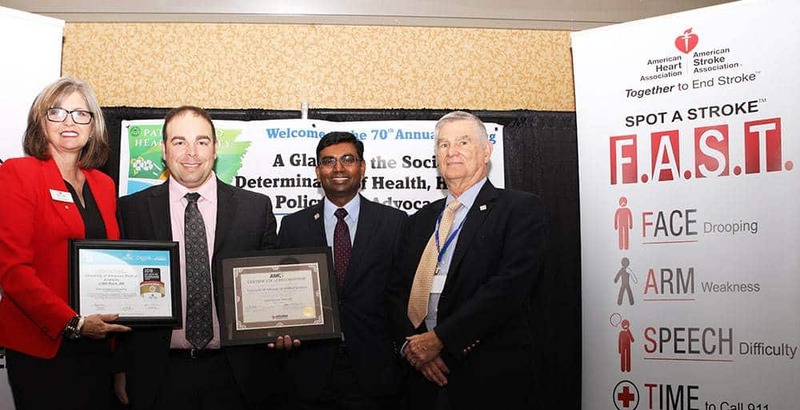 Along with officials from the Arkansas Heart Association and the Arkansas Department of Health, Matthew Mitchell, M.N.Sc., R.N., second from left, displays the awards the UAMS Stroke Program recently won. May. 21, 2018 | May 21, 2018 | Excellence in treating stroke patients recently garnered two awards for the University of Arkansas for Medical Sciences (UAMS) Stroke Program. The American Heart Association honored the program with the Target: Stroke Honor Roll Elite and Get with the Guidelines-Stroke Gold Plus award. The Arkansas Department of Health recognized the program with a Defect Free Stroke Patient Care award for the overall quality of UAMS’ stroke care. The Target: Stroke Honor Roll Elite recognition acknowledges the program’s compliance with standards for quick and timely treatment of stroke as well as counseling and follow-up treatment at discharge. The Get with the Guidelines-Stroke Gold Plus status recognizes the program’s continued high performance by those measures for an entire year after receiving a Gold or Silver award.